NAIROBI , Feb 27 2013 (IPS) - When Kenya’s only female presidential candidate, Martha Karua, dismissed electoral opinion pollsters who claimed that she stood a mere one percent chance of being elected to office, many said she did so because the results had not favoured her. Karua’s misgivings were, however, not without merit. The issue of sampling methodology and procedures used by opinion polling companies to arrive at their conclusions have raised serious concerns in this East African nation ahead of its Mar. 4 elections. “Pollsters use registered mobile phone users as their sampling frame, as opposed to the Independent Electoral and Boundaries Commission’s (IEBC) list of registered voters,” statistician Charles Onyango told IPS. “Recent opinion polls have shown that, while 95 percent of their respondents claim to be registered voters, only two-thirds are registered voters according to IEBC records,” he told IPS. There are three main electoral opinion-polling companies in Kenya — Infotrack, Ipsos Synovate and Strategic Research — and their research results have received extensive media coverage, often becoming big headline news. But political analysts continue to claim that these polls are commissioned by biased sources and rather than reflect the opinion of the public, their controversial results are more likely to influence voter behaviour and possibly result in violence. According to political analysts, in 2007 current Prime Minister Raila Odinga’s supporters refused to concede defeat because the opinion polls had predicted that he would win the presidency. “And the danger is that there are many who don’t understand that an opinion poll is not an electoral poll,” Paul Muigai, a political analyst in Nairobi, told IPS. “It is this misconception that largely contributed to the much-disputed 2007-08 general election violence provoking a near civil war,” he added. After Kenya’s first presidential debate held on Feb. 11, pollsters claimed that presidential candidate and Deputy Prime Minister Uhuru Kenyatta look the lead in the polls. But Wilson Ugangu, a media analyst and lecturer at Multimedia University College of Kenya, told IPS that the results of such a poll could not be useful in providing a picture of likely voting trends, winners or losers in the coming elections. Ugangu added that those who listened through the radio, and those who watched the debate, certainly formed two very different perceptions of the candidates. Such concerns affect the general credibility of polls. “This country has not reached the point of having reliable and trusted pollsters because they withhold vital information. For instance, we don’t know who funds them and whose interests they serve,” Steve Bonuke, chair of Trans Youth Group, a youth group in the Rift Valley Province that promotes peace, political tolerance and youth empowerment, told IPS. “Their results will only fan tension, conflict and violence as they did in 2007-08 when losers believed in pollsters more than they did in the electoral body,” he said. Bonuke pointed to a recent series of opinion polls carried out by two major polling companies within the same period, targeting similar counties and which arrived at significantly differnet results. According to political analysts, electoral polling will have a significant impact when Kenyans cast their ballots. “If they do not (predict) trends carefully, they could raise the public expectations and cause euphoria around perceived winning candidates, and result in a disputed election. “Many Kenyans don’t know that electoral opinion polls are sample polls and not election polls….When the outcome of the elections goes against what the pollsters are saying, we might have a repeat of the 2007-08 violence where losers might refuse to concede defeat,” Onyango says. It is a concern shared by the chair of the IEBC, Isaack Hassan, who has previously called for opinion polling to be barred for three months prior to the general elections. But there has been little political support to regulate the process. When former member of parliament, Bonny Khalwale, introduced the Publication of Electoral Opinion Polls Bill to parliament in 2011, it faced stiff opposition from those who have been consistently favoured by the polls. The bill was meant to regulate electoral opinion polling according to international standards. “Odinga opposed the bill vehemently because opinion polls always favoured him,” Muigai said. Although the Publication of Electoral Opinion Polls Act 2012 demands that pollsters reveal information on the methodology used, like, for instance, who was sampled and from which region, this is yet to happen. “The issue of sample spread is key. If you are collecting data in Nairobi County, and have a lazy data collector who only samples people in Kibera, the results cannot be representative,” Onyango said. This, he said, was because Kibera is one of Odinga’s strongholds. “You cannot sample one sub-ethnic group and claim that the results are representative of the communities’ voting patterns. 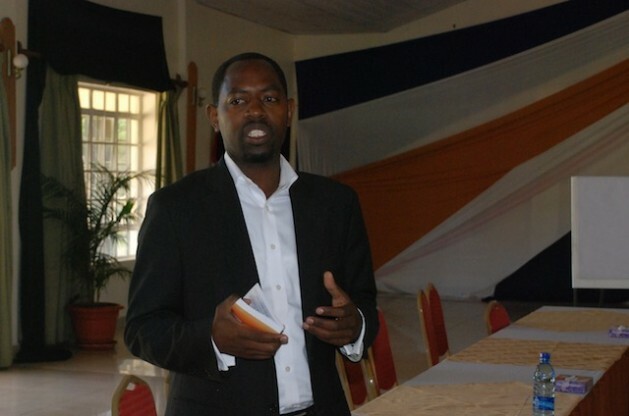 Each community tends to gravitate towards certain politicians,” Onyango added. Immaculate Musya, a politician formerly with the Orange Democratic Movement Secretariat and who is no longer contesting the elections, also questioned who pollsters used as samples. “I have never been sampled — neither do I know anyone who has. I live in Nairobi and am constantly in the streets,” she told IPS. Jennifer Massis, who is vying for a seat in parliament in Rift Valley Province, sees no harm in polling.